How to find the area of an oval? This equation of an ellipse calculator is a handy tool for determining the basic parameters and most important points on an ellipse. You can use it to find its center, vertices, foci, area, or perimeter. All you need to do is to write the ellipse standard form equation and watch this calculator do the math for you. This article was written to help you understand the basic features of an ellipse. Read on to learn how to find the area of an oval, what is the focus of an ellipse, or how do you define the eccentricity. If you like the ellipse calculator, try the octagon calculator, too! An ellipse is a generalized case of a closed conical section. It is oval in shape and is obtained if you slice a cone with an inclined plane. In the case when the inclination angle of the plane is equal to zero, you obtain a circle (circles are a subset of ellipses). If you want to draw an ellipse, you need to determine two points, called foci (points F₁ and F₂ in the image above). Then, the ellipse is defined as a set of all points for which the sum of distances to the first and the second focus is equal to a constant value. In a circle, both foci overlap at one point. b is the distance between the center and the ellipse's vertex, lying on the vertical axis. Our ellipse standard form calculator can also provide you with the eccentricity of an ellipse. What is this value? It is a ratio of two values: the distance between any point of the ellipse and the focus, and the distance from this arbitrary point to a line called the directrix of the ellipse. Every ellipse is characterized by a constant eccentricity. If the ellipse is a circle, then the eccentricity is 0. If it is infinitely close to a straight line, then the eccentricity approaches infinity. eccentricity = √(b² - a²) / b for a vertical ellipse. 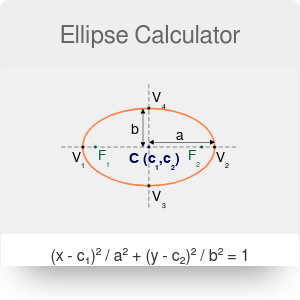 Apart from the basic parameters, our ellipse calculator can easily find the coordinates of the most important points on every ellipse. These points are the center (point C), foci (F₁ and F₂), and vertices (V₁, V₂, V₃, V₄). To find the center, take a look at the equation of the ellipse. The coordinates of the center are simply the numbers (c₁, c₂). Ellipse Calculator can be embedded on your website to enrich the content you wrote and make it easier for your visitors to understand your message.